I used American Apparel Palm Springs as a base for all nails except the ring finger, where I used China Glaze Salsa. The lace was just some cheap lace edging I got at Wal-mart. Topped it off with 3 or so coats of Seche Vite top coat... I dunno, I lost count. oww - they look picky - but neat!! Absolutely interesting, but they sure don't look comfy. Thank you for enduring it for us! Nope, this doesn't do it for me at all. But kudos to you for trying it and spending what must have been hours on it! I looved, is AMAZING ! I think they look pretty awesome but I'd probably cut them and then stick them on false ones... way too much effort for me. I'm copying your zip nails tomorrow though. Hey...a little lace poking out of the zips would look great! Waaaay too hard though! from the thumbnail from my followers page it looks like snake skin. Just want to congratulate you for your blog and the various tips posted here and endless creativity. Congratulations. And also did a post on my blog talking about your work, if you have any problems just let me know that I take from the blog. Kisses and success to you. well, i never would have been able to do that as well as you did, let's just say. Oh my god... Those must have been a real pain to get off!!! Easier or harder than glitter?? Oi! Ficou bem legal, mas realmente parece não ser nada confortável ! Você é muito criativa ! You're being too hard on yourself. They look really pretty! Konad needs to make a plate that's just a big solid lace print. Then you could pick and choose sections for each nail, so they'd all be unique and you could have the look of lace nails without the feeling. Brynne, I agree, I've thought that before too, I also think that they should do custom ones, or just more patterny ones. 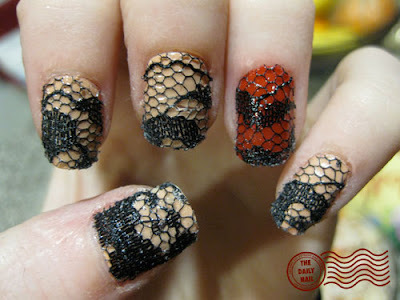 They look interesting, but seem sooooo unsanitary... so many nooks and crannies in the lace to get nasty crusties stuck, ew!